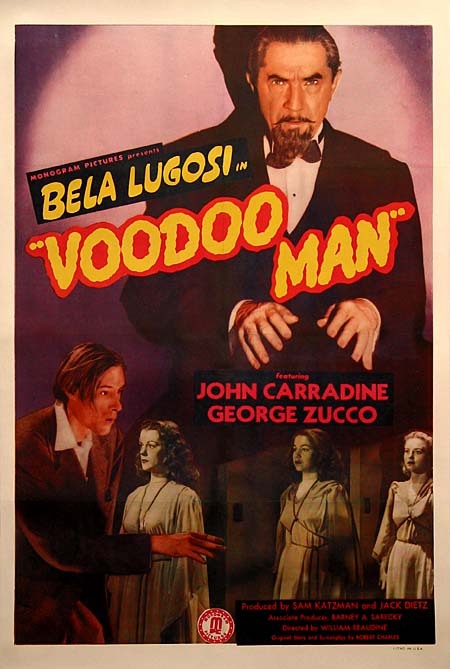 Bela Lugosi in a B movie that I have never heard of? Yes, please! Voodoo Man is SO MUCH of what it is: a near-perfect example of a low budget “B movie” churned out by a minor studio, wishing to do nothing more than support the main feature at the local picture show. Double features became very popular during the war years as studios and movie theaters tried to stem the tide of decreased attendance. The audience was promised two big features, one of which always ended up being a shorter, cheaper picture made specifically to round out the “A” picture at the top of the bill. Every major studio had units devoted to making “B” pictures; some studios, like Monogram, Republic, and Ascot, made nothing but “B” pictures. Voodoo Man is a Monogram picture; it might just be the ultimate Monogram picture. The Plot in Brief: Nicholas (George Zucco), the shifty proprietor of a gas station, is secretly in cahoots with the town’s resident voodoo man, Dr. Marlowe (Bela Lugosi). Whenever a comely young girl stops by the gas station to ask for directions, Nicholas secretly phones Marlowe and has him set up a fake detour down the road, which ushers said lost lovely into Marlowe’s clutches. See, Marlowe is still grieving the loss of his beautiful wife twenty-two years earlier and is convinced that a voodoo ritual involving the transference of souls will allow her to live again. Time and time again, the ritual fails. Will latest lovely stranger Betty Benton (Wanda McKay) be just the “soul match” needed to complete Marlowe’s terrible, terrifying (not really) scheme? Can audiences stay awake for the entire 63-minute length of this film? In Voodoo Man, Bela Lugosi, George Zucco, and John Carradine are a troupe of seasoned pros saddled with a ridiculous premise, paper-thin characters, insipid dialogue, and woefully amateurish supporting actors, but they give it their all. Lugosi (who never once in his life “phoned it in”) tries to create a portrait of a mad genius driven to insanity by grief over his wife’s passing. Zucco, handed the most risible role, commits like a champ, shouting and hissing the nonsense words he has been given to chant during the film’s interminable voodoo ceremony sequences. 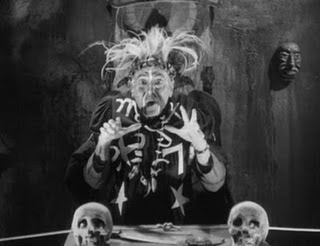 Zucco must even perform rope tricks during this patently silly voodoo séance. 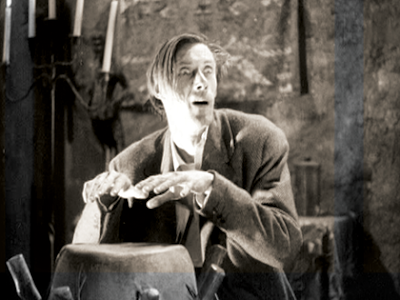 Meanwhile, Carradine plays Toby, a low-rent version of Lenny from Of Mice and Men. He dumbs it down, pets the female victims’ hair, and feverishly plays the bongos. Even though all three of these men are slumming, they put forth a good effort. The film reminded me of Chuck Berry back in the 1980s, touring the country backed by random pickup bands that the local promoters would throw together. No matter how piss-poor the local backing band, Berry played like a champ. After all… he was the one audiences had come to see! Director William "One Shot" Beaudine was so nicknamed because he never did a second take. He worked fast and cheap, and the pictures came in on schedule and under budget. Beaudine’s unique, cost-cutting fingerprints are all over this one: 1) Endless tracking shots that follow characters walking from one place to another. 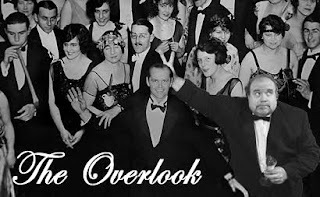 Modern viewers can play the following drinking game with Voodoo Man: whenever characters walk into a room in a tracking shot that follows them all the way from the door to their destinations, take a drink. Paramedics will be pumping stomachs by the 30-minute mark. This seems to be Beaudine’s signature shot in Voodoo Man. Think about it: do that twenty or thirty times, and you’ve got half the running time. 2) Mistakes that are not corrected. Early in the film, a newspaper headline tells us of “clews” the police are following. Was there no time to proofread the newspaper or do that shot again? 3) Mistakes that are not reshot but repeated so they start to grow on you. For example, the leading lady's front door sticks when she opens it. Did they keep that shot in the film? Of course—and the door continues to stick every time it is opened! Voodoo Man was shot in seven days. Actually, Voodoo Man seems to be channeling Val Lewton's superior 1943 film I Walked with a Zombie—and by “channeling,” I mean, “directly stealing from.” Lewton’s film was lauded for its dark, atmospheric “walk through the sugar cane” sequence, and a laughable amount of Voodoo Man’s running time is devoted to lovely girls in revealing, ritualistic dresses walking… and walking… nowhere in particular. Do that twenty or thirty times, and there’s the OTHER half of the running time! Voodoo Man should have been retitled The Walking, Walking, Walking, and Walking Dead. But Voodoo Man also seems to be setting the template for the latter, better film, Tobe Hooper’s The Texas Chainsaw Massacre. This may have more to do with Voodoo Man sharing some common tropes with dozens of other horror films, but hear me out. We have lost travellers at a gas station, ignoring a harbinger of doom. We have the kidnapping and terrorizing of these lost strangers. We have a crazy “family” living far from town in an unassuming farmhouse that hides unspeakable horrors. 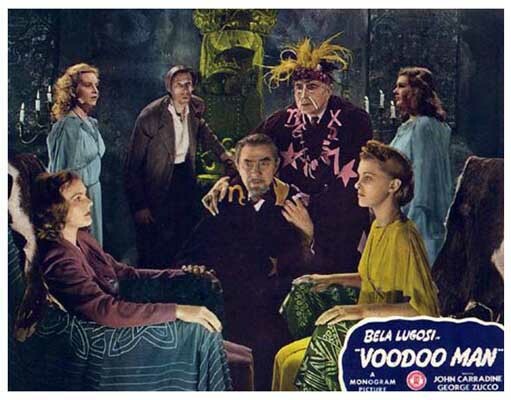 (Well, in Voodoo Man, the horrors are speak-able, totally speak-able.) Said crazy family is composed of the grotesque, the feeble-minded, and the psychotic. Is any of this starting to ring a bell? This juxtaposition is just one of the reasons to love this film without snickering or irony. Because, in the final analysis, I loved Voodoo Man. I loved it not only for its cheap-jack sincerity and “we are going to do our best and get through this” lead performances, but also, babies, because I will watch anything with Bela Lugosi in it. Voodoo Man is now available on Blu-ray disc from Olive Films. A previous DVD edition from Legend Films includes the gentlemen from Rifftrax Live, poking fun of the film as it unspools. Both make excellent Christmas gifts. "I will watch anything with Bela Lugosi in it. How about "Scared to Death"? Makes me wonder if there's more Lugosi films out there that fit this pattern. Yes, even as late as 1944, these films are still cashing in on the "seductive" Lugosi vibe from the original 1931 Dracula. 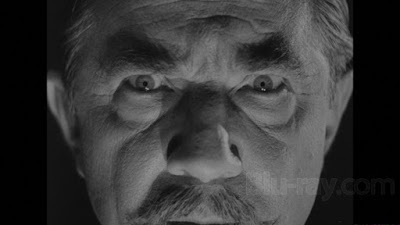 There are close-ups of Lugosi's eyes in Voodoo Man (see above) that look exactly like those in Dracula. The kidnapped zombified women are also highly reminiscent of Dracula's brides. It shows just what an impact and influence the original Dracula enjoyed. Or maybe in the spirit of William "One Shot" Beaudine, we have Bela "One Plot" Lugosi! Hee, HEE, HEE!!! "babies, I will watch anything with Béla Lugosi in!" me too. Except Ed Wood! You forgot to mention the clever twist at the end which is lifted directly, in part, from the end of my favorite: The Black Cat 1934. I was howling in laughter!!! :D I kept watching the clock waiting for this to end, not enough Béla for me. But that ending! Fell on the floor laughing!!! Well worth waiting thru the snoozefest, loved it! And I hate to say it but John Carradine stole the show!